!!! Warning -- Sections in Red Italics Contain Graphic Stories of Combat -- Warning !!! Stories read well even without these sections. SUICIDE !!! Combat Deaths still happening forty years later. The hidden enemy !!! SUICIDE!!! It's been 50 years since the Vietnam War began and people on both sides are still dying and suffering from it's tragic after effects. 1st Battalion, 8th Infantry, 4th Infantry Division will hold their 5th annual meeting again in Townsend, Tennessee May 6-9th, 2019 at the Talley Ho Inn [Phone: (800) 448-2465 - tell them you are with the 1/8th Reunion]. Looking forward to seeing all you Bullets there. The support troops, who made life bearable for us are especially welcome. Bring the wives, lots of sight seeing in the beautiful Cades Cove area during the day. The most fun for veterans will be the informal chats around the pool in the evenings. Bring any memorabilia you have to display if you like...no live ordnance please. 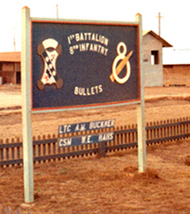 My memories as an Infantry Small Unit Commander in Viet Nam, with B/1/8 and D/1/8, 4th Infantry Division, from AUG 1968 - MAR 1970. Here you will experience life among the Grunts, who slept in the mud of the Ho Chi Minh Trail on the Cambodia/Laos Border. There are stories of unsung heroes, bravery, regrets, and haunting mistakes. 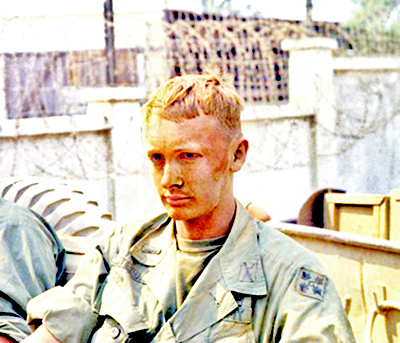 I was a Platoon Leader, Executive Officer, Headquarters Commander in base camp, and a Company Commander in the field. Come along as I recall courage, death, anger, fear, sadness, and red Pleiku mud. Arriving a Second Lieutenant and leaving a Captain after two consecutive tours, nearly destroyed me psychologically. Go on to the 4th Infantry Division Unit Pages to get the full story. Over 300 Veterans have contributed materials to this site. of 1/8th Infantry. We wore a bullet in the camouflage band of our steel pots, a sign we did not intend to be captured alive! 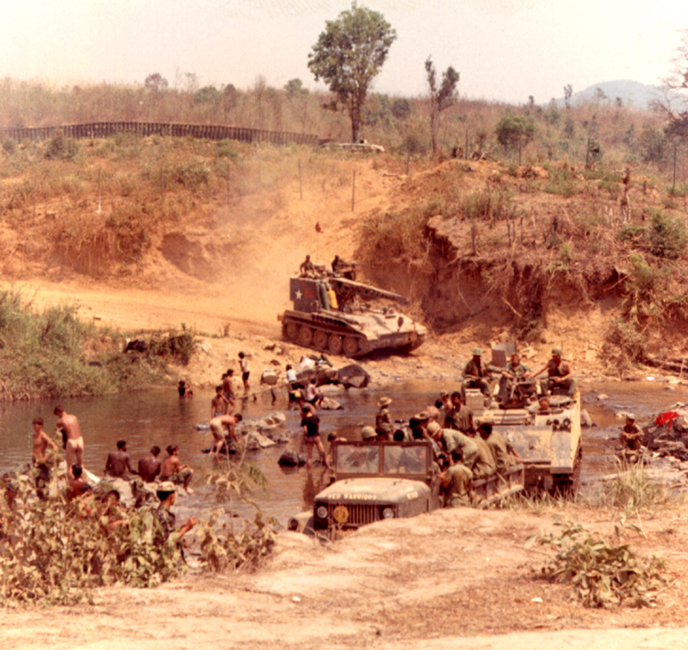 Above - Me as XO of B/1/8 on run from Dak To to Pleiku during the dusty dry season. Below - Bathing in a stream at Polei Kleng, just minutes before a mortar attack and my departure to join Task Force Alpha. 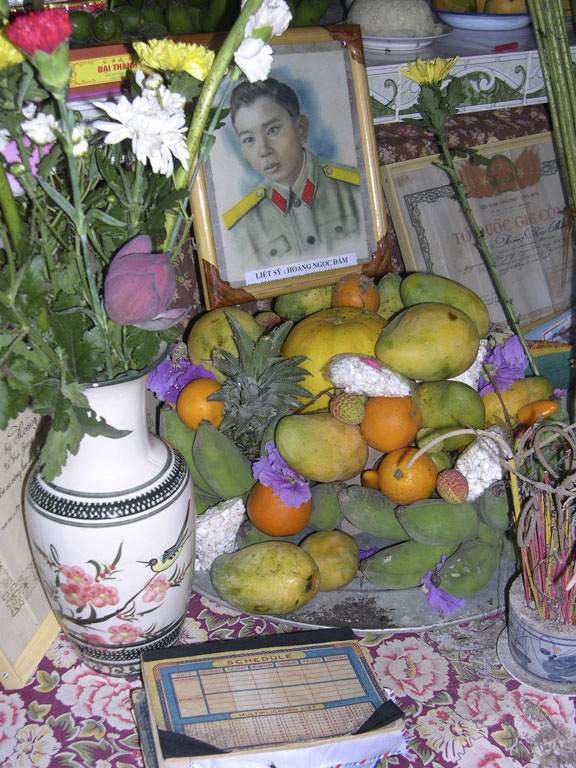 Someone I deeply regret KILLING, was a young NVA Medic, Hoàng Ngọc Đảm. This photo of Dam is on an Altar in his family's home. To view other Personal Documents carried by this heroic Medic, the story of our deadly encounter, and the impact of returning these personal documents to his family and village, nearly 35 years later, click on the photo. This simple act resolved only one of the nearly 200,000 missing in action cases Vietnam is still desperately investigating. In May 2008 I returned to Vietnam and aided the Hoang family in locating and returning Dam's remains to the family cemetery. 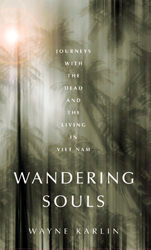 Nation Books released Wandering Souls: Journeys With the Dead and the Living in Viet Nam late in September 2009. On March 19, 1969, then young First Lieutenant Homer R. Steedly, Jr., shot and killed a North Vietnamese Medic, Hoàng Ngọc Đảm, when they met on a jungle trail. Nearly forty years later he returned to locate and bury Dam's remains in the village cemetery. This book tells that emotional journey with details from both sides. It is a captivating story written by Wayne Karlin, a former Marine Corp helicopter door gunner in Vietnam, who has written extensively on the Vietnam War and visits the country often. The "Thou Shalt Not Kill" section above tells of his aid in my journey. My version of the story pales in comparison to Wayne's. Everyone should read this story. It will touch your very soul. To read my complete story, click My Combat Stories. To read about the other units, who served with me in the 4th Infantry in Vietnam, click on 4th Infantry Division Unit Pages. These links also appear on the floating menu for Java equipped browsers. Any of you who served with me, please contact me and tell me what you remember of these events. I can't be sure my memories are accurate after over all this time and I know each of you have different viewpoints and memories. You all have stories to tell, many that I was too busy to even notice. Write, email, send photo's, video, audio tapes. I will incorporate all stories into this site's guestbook and return your precious materials to you safely. I want to tell our story from all our perspectives. It's time everyone found out about us and what we did over there. Not all heroes got medals, in fact most did not. I do not remember all your names, but I do remember your courage every day, when I wake up alive and free, and again every night before I fall asleep. Help me to keep the memories of those we left behind alive for future generations. As John Lennon so aptly said in his 1969 single, lets just "Give Peace a Chance". Where are all you support and service troops??? We grunts would never have made it without you. I know you have stories to tell...we want to hear them also. If you decide to call me, you have to leave a message and return number. I only pickup for family. I will call you back as soon as I get your message. the battle on 29 APR - 4 MAY 1968 is looking for fellow veterans. Seeking Information about the Tracer 5 incident in March of 1969. If you knew Mike, email swamp_fox at the address at the bottom of this page. Sp/4 James Wagner. C Company, 3rd BN, 12th Infantry, 4th Infantry Division. Jim's tour began on April 10, 1967 and ended with his death on January 28, 1968. The incident resulting in his death describes it as friendly fire, died while missing. His body was identified on February 2, 1968. If anyone in that unit can give any additional information about Jim, it will be appreciated. Contact me through the Swamp_Fox email address at bottom of page. Daughter of Larry (Bemis) Savin --- K Company, 75th Rangers, is looking for a picture of him in Nam. Her Dad just passed away & she wants to know more about him. She said that he was wounded but doesn't know the date. If you can help with this, contact me at the Swamp_Fox email address at the bottom of the page. I need your help! I get many requests from Veterans and their families to locate orders that show their awards and decorations, often to correct their personnel files, or to receive benefits. If you have any orders from Vietnam, awards and decorations orders, travel orders, anything that has names of servicemen who served in Vietnam, please get me a good photocopy, or even better a 200dpi computer scan of them. I will not release any SSAN or Service numbers to anyone, except those listed on the orders. This is really important! Go through your stuff...copies of orders were often included in the awards case, when the award was made, and they have many other people listed, as well. PFC James O. Holiday, D/1/8th Infanrty, served in Vietnam from January 1966 - wounded 7 January 1968. Looking for fellow soldiers. Mark Garrison, 119th, AHC (Croc's and Gators), flew during the final extraction of Task Force Alpha from Hill 467. He was one of the Croc's who provided gunship support for us and his book "GUTS 'N GUNSHIPS" gives great insight into what these brave souls faced during their tour. My respect for those brave aviators has always been deep, but hearing the details from their perspective, makes their courage and dedication even more amazing. Read this book if you want to know more about the pilots, co-pilots, and crew and their daily lives in combat. You can hear an audio of his role in the Battle of Hill 467 by Task Force Alpha Here. Robert Clifton is looking for members of C/2/35th Infantry, who might have been in country, when he received the Bronze Star. The 4th Infantry Division underwent a major reorganization and became a “modular” division, and as a result, the 124th Signal Battalion was inactivated on 16 December 2004 and remains inactive to this day. A Specialist from Hq & Hq Bn, 4th Inf Div has located thousands of photos from the 124th and needs help identifying these images in his efforts to preserve these important historical documents. Click Here to see his guestbook posting. Colonel Hale H. Knight was 1st Brigade Commander with the 4th Infantry Division in Vietnam from 24 October 1968 through 21 April 1969+. He was one of the finest combat leaders I have ever known. Only recently have I learned where he came by his incredible understanding of the soldier on the ground in a jungle environment. It appears Colonel Knight was a hero and accomplished jungle fighter early on in his career while serving with Detachment 101 of the Office of Strategic Services in the China-Burma-India Theater of World War II. 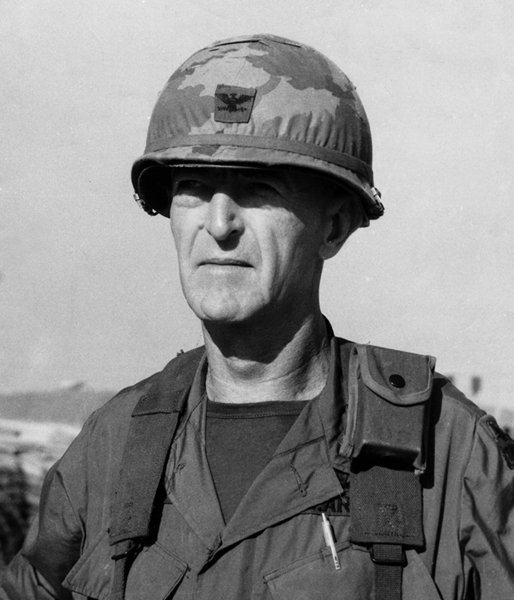 Colonel Knight died in June 2001 and was buried in Arlington that July. His family has graciously allowed us to post nearly 200 photos from his personal collection. Many of the Brigade and Battalion Staff, as well as, many Company Commanders are shown here for the first time. Click on his photo for the full story and photo gallery. Joe Galloway's "God's Own Lunatics" tribute to the 4,095 helicopter pilots, crewmembers and observers lost in the Vietnam War. 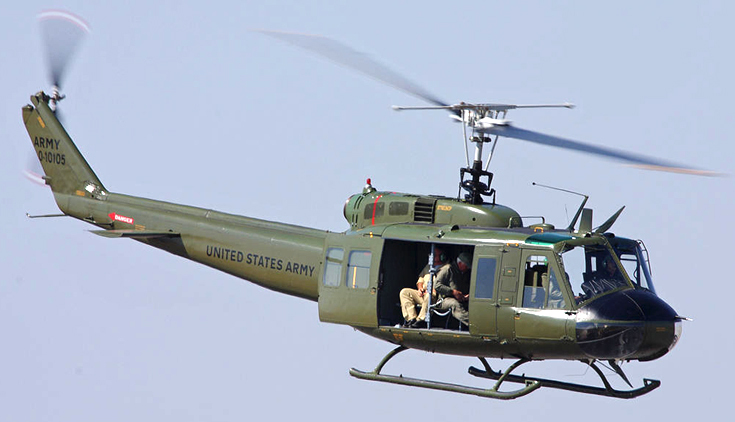 The sound of chopper blades still stir my soul nearly half a century later. Visit www.tibart.com, a wonderful nature photography site designed by my wife, Tibby. (Some of my photography is shown there also.) Her YouTube channel is pisgahtib --- my channel is swampfoxrvn. Please send me the link to any page with errors since the last site update. I served two tours in the Jungles of the Central Highlands of South Vietnam, along the Cambodia/Laos border, patrolling the Ho Chi Minh Trail system...Dak To – Ban Me Thout – Pleiku – An Khe – Qui Nhon, but spent most of my time in the triple canopy jungles, sleeping in the mud, heat, insects and climbing those awful hills. Webmaster:Homer R. Steedly Jr. (Email: ) Copyright 08/12/1995 - 04/05/2019. Commercial Use of material on this site is prohibited.